The Worker-driven Social Responsibility model hits new milestone, continues its expansion in world of business and human rights! Meanwhile: Migrant Justice receives the National Education Association’s prestigious Cesar Chavez Civil and Human Rights Award; pressure increases on Ben & Jerry’s to finalize agreement to implement WSR-based Milk with Dignity Program in ice cream icon’s dairy supply chain. As the Fair Food Program consolidates the unprecedented human rights gains secured for tens of thousands of farmworkers on participating farms in Florida and up the East Coast — and plots a course for continued expansion into new states and new crops in the months ahead — the Worker-driven Social Responsibility (WSR) model, born with the implementation of the FFP in 2011, continues its own consolidation and expansion both here in the US and abroad. The Workers Rights Consortium (WRC), a leader for over two decades in the fight for workers’ fundamental human rights in the garment industry and a principal architect of the pioneering Bangladesh Accord, announced last week an agreement to renew the Accord, which has been called “the most successful workplace safety program ever introduced in contemporary apparel supply chains,” for an additional three years. 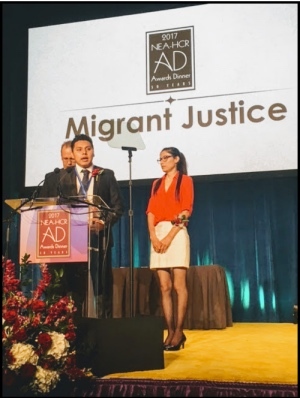 Enrique Balcazar and Zully Palacios receive a standing ovation from over a thousand teachers from across the country as they accept the NEA award on behalf of Migrant Justice last week. At the same time, Migrant Justice (MJ), the dairy workers’ organization in Vermont that won a groundbreaking agreement in principle with Ben & Jerry’s in 2015 to implement a new human rights program based on the principles of Worker-driven Social Responsibility, has received (right) the National Education Association’s prestigious “Cesar Chavez Civil and Human Rights Award.” The award adds fresh momentum to Migrant Justice’s public campaign calling on Ben & Jerry’s to finalize its 2015 agreement to partner with MJ in the implementation of the key elements of Worker-driven Social Responsibility in its dairy supply chain. Both of these developments represent significant advances in the effort to consolidate and expand the gains of the still nascent Worker-driven Social Responsibility model. Despite its demonstrated and repeated failures, the discredited Corporate Social Responsibility (CSR) approach maintains a strong grip over the business world. Meanwhile, consumers’ calls for ethical supply chain practices by the brands they buy from grow louder by the day. Nowhere, of course, is this clash between the traditional, public relations-driven CSR approach and the new WSR paradigm, with its proven ability to dramatically improve human rights conditions in long-recalcitrant sectors from agriculture to apparel, more stark than in the CIW’s Wendy’s campaign. These new advances in Bangladesh and Vermont promise to redound to the benefit of workers everywhere, including here in Immokalee, seeking a voice in the workplace and a leading role in the protection of their own fundamental human rights. … The primary purpose of extending the Accord is 1) to ensure that the safety progress achieved under the original Accord is maintained after 2018 and that factories cannot return to the unsafe practices of the past, and 2) to bring about needed safety renovations in more factories, as signatory brands and retailers identify new suppliers, which will then come under the coverage of the Accord. … Renewing the Accord will also allow for the continuation of its groundbreaking worker training program. The program, focused in particular on worker participation in factory health and safety committees, involves training of a length and intensity far beyond typical supply chain training schemes. The extension of the agreement will allow this important program to be fully implemented at a larger number of factories. … Aleix Gusquets Gonzalez, head of C&A Global’s external stakeholders’ engagement, said 41 percent of the garments sold by the worldwide chain of clothing stores are produced in Bangladesh. Jenny Holdcroft, assistant general secretary of IndustriALL [a Switzerland-based global trade union], said a key aspect of the Bangladesh accord is putting tools for health and safety improvement in the hands of the workers. The renewal of the Accord is a testament to the value of the new model of labor rights enforcement that the program represents – one defined by binding obligations for buyers, real consequences for unsafe suppliers, and a recognition of the fact that it costs more to produce under good conditions and that buyers must share these added costs. I believe that this model, elements of which derive directly from precedents first set by universities in their labor codes, holds the key to achieving broad and sustainable labor rights progress in global supply chains. I am proud of the leadership role the WRC has played in the conception, creation and implementation of the Bangladesh Accord. The agreement has made factories safer for more than 2.5 million garment workers, including tens of thousands of women and men making university logo goods. It is heartening to see both global corporations and labor unions recognizing the value of the Accord and moving to renew and extend it. These two advances in the growing struggle for the heart of corporate accountability — between the dominant, and increasingly discredited, CSR model, on the one hand, and the new WSR paradigm on the other — are sure to reverberate for some time to come. The next four years in Bangladesh promise to see not only deeper and broader gains in health and safety conditions for workers in the factories covered by the Accord, but may well bring the expansion of the Accord’s principles to issues well beyond worker safety. And Ben & Jerry’s will undoubtedly find it increasingly difficult to justify its failure to finalize its agreement with Migrant Justice when the highly-regarded worker organization continues to receive national recognition for its courageous and effective work. Worker-driven Social Responsibility is superior to the traditional CSR approach for one reason above all others: It works. CSR, quite simply, cannot make that same claim. On that note, be sure to check back in the coming days for a new article from the CIW published last week in the Wake Forest Law Review, the most comprehensive description and analysis yet of the Fair Food Program, and the model to which it gave rise, WSR, to date.